In addition to bird watching this weekend, we're getting ready for our annual homeschool Valentine's Day party. Every year, we get together with other homeschoolers in our group to exchange cards and play super fun themed games. It's something we look forward to because it gives us an excuse to celebrate our friendships. On Valentine's Day itself, I typically make homemade french toast for breakfast and place a card and little gift at my children's regular place at the dining room table. My kids rush off to make me handmade cards or crafts. It may be a perler bead coaster in the shape of a heart, a sketch of one of our animals, a heart-shaped LEGO masterpiece, or a poem. 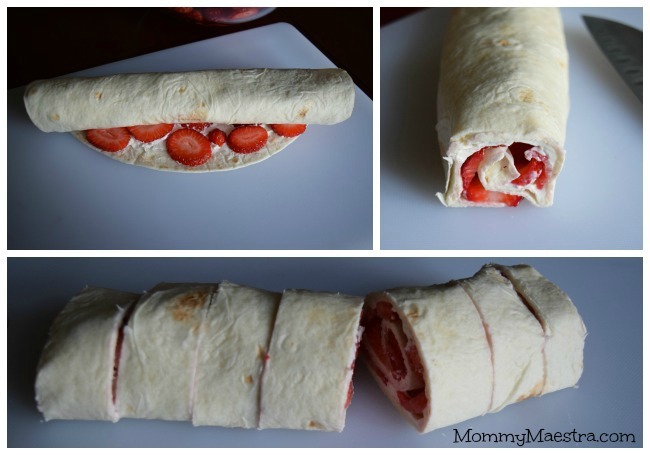 I'll cook my kids' favorite meal and bake my husband's favorite dessert. We don't go crazy buying extravagant gifts, but prefer to give instead a heartfelt regalito just as an extra special way to show our love for each other. Because love and friendship is what this life is all about, no? And that is why I love this little Sesame Street Valentine’s Day behind-the-scenes clip of Rosita teaching Abby how to say words of affection in Spanish in anticipation of Valentine’s Day. Even though my kids are older now, they still enjoy watching clips like this one from the show (they especially love watching parodies about movies and characters the love, like this one and this one). A few years ago, I had the opportunity to interview Carmen Osbahr, the talented Latina behind the Rosita muppet. She is funny, vibrant, smart, and just as lovable as the characters she makes come alive on screen. And more importantly, she is making a difference in the lives of children all across the country - especially Latino children who have the opportunity to relate to and learn from the bilingual Rosita and Ovejita characters. I absolutely loved meeting her. In fact, I have a little Rosita doll that sits on the headboard of my bed. She's frequently the first thing I see in the morning and a reminder of everything I love: children and education. My kids sometimes sneak into bed with me in the morning and reach out for her. Or if I am sick, they'll tuck her into bed with me to comfort me. They think it is fantastic that mama has a doll. So in honor of Carmen and Rosita and Valentine's Day, I decided to make a special yummy (and healthy!) 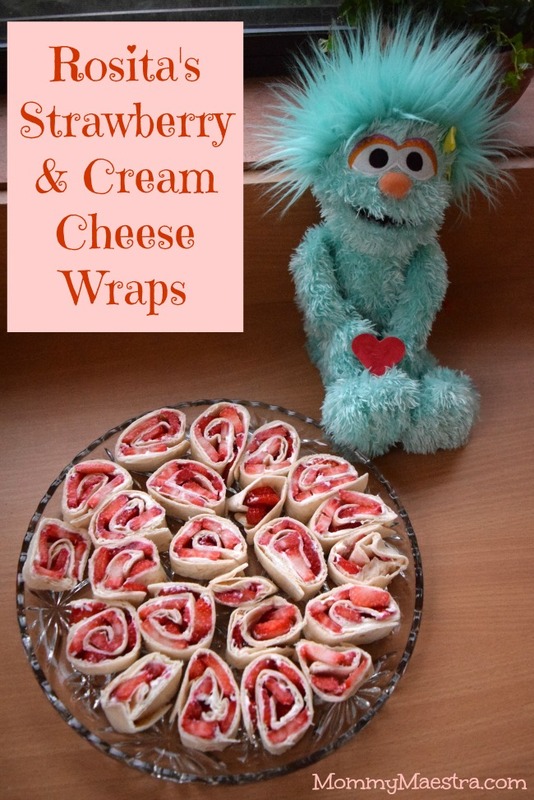 recipe to take with us to today's Valentine's Day party. 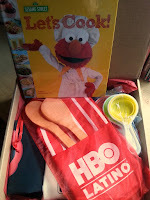 The recipe is below...and don't miss the great giveaway from Sesame Street!! Be sure to tune in to watch your favorite characters on Saturday mornings at 9:00 am ET on HBO. They have a special Valentine's Day episode airing tomorrow morning that I know your kids will absolutely love. How about you? How does your family celebrate Valentine's Day? First, thoroughly wash your strawberries and slice them up, discarding the tops. 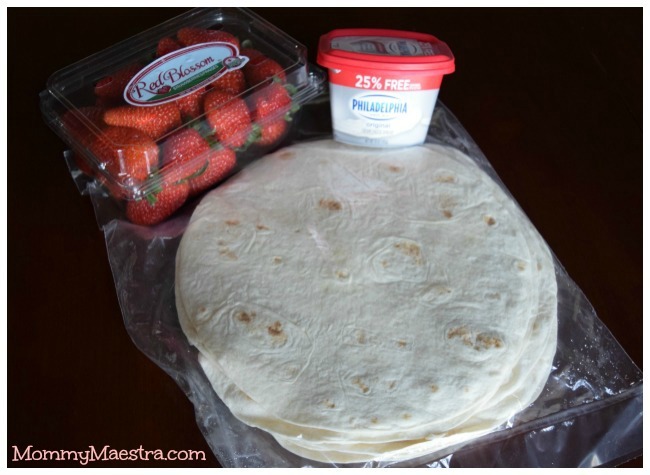 Next, spread the cream cheese over one tortilla. 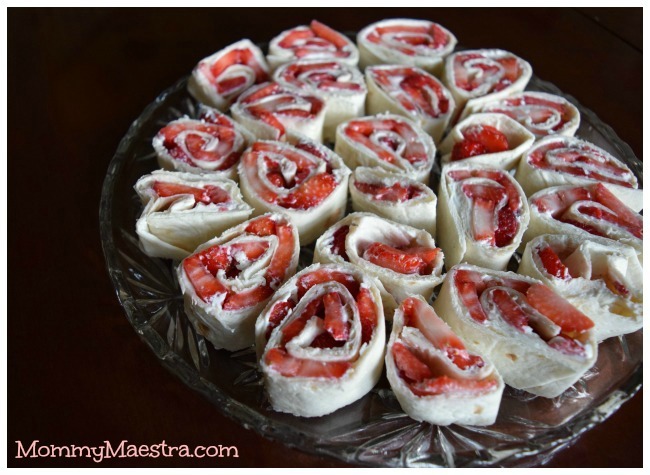 Take your strawberry slices and arrange them on top of the cream cheese leaving an inch or so clear around the edges. Starting at one end, tightly roll up the tortilla. Using a sharp knife, cut off the ends. Then cut the roll into sections, maybe an inch and a half wide or so. Carefully arrange the sections on a plate and refrigerate for at least one hour before serving. One lucky reader is going to win a Sesame Street Prize Pack that includes a tote bag, child’s Elmo apron, Sesame Street cookbook, and cooking utensils! Wouldn't this be a great surprise gift for your little sweetie? This year we are celebrating with a fun birthday party and possibly going to a special music program for kids. We spend the day together doing family stuff. This year we went to the movies. Got gifts too. I baked special things. A special roll and we watched a little movie. My kids made me cards. My husband gave me a big (Hershey) kiss. We go out together as a family for a special treat and spend time sharing why we appreciate one another.